Libia is the proud owner of Latina Spanish School. Young and old, experienced, advanced or a total beginner: all type of students and levels are welcome to give their Spanish skills a boost. Peru Volunteer already works together with Libia for some years. Before you start volunteering, it is important to learn at least the basics of the Spanish language. But learning Spanish is a great investment! Spanish is a global language: it is the official language in 20 countries and more than 600 million people speak this beautiful language. Spanish is not just a nice language, it is extremely useful and versatile! 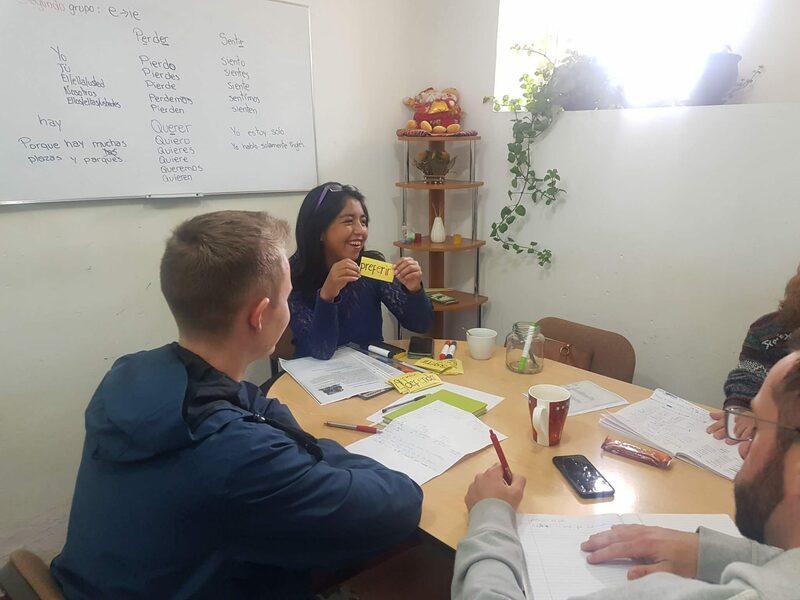 Latina Spanish School is located in the center of Cusco, a few minutes away from Plaza San Francisco. The school is small, but cosy! There are three classrooms. Lessons are in small groups of 4 or 5 students, which is great when you want to learn a new language. It is also possible to follow private classes, if you want to learn the language even quicker. 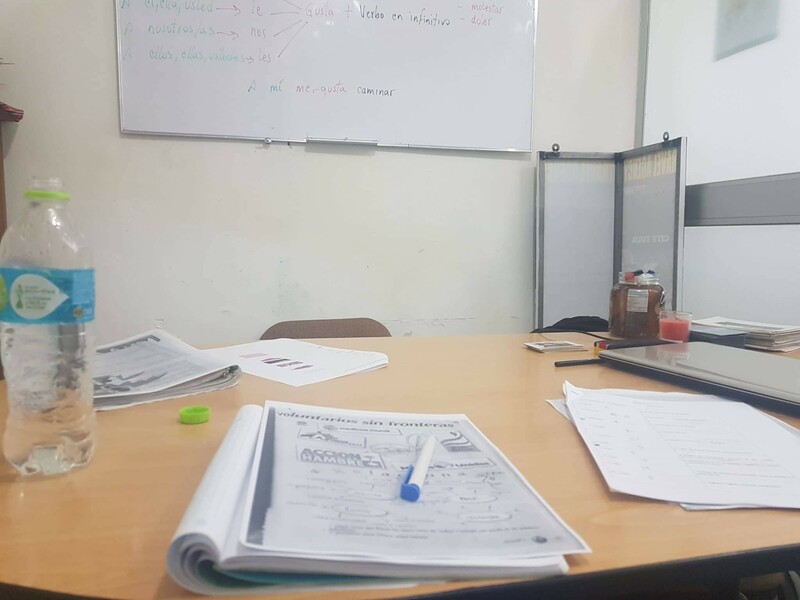 If you are not a total beginner you will first make the short entry exam from Peru Volunteer, to establish your Spanish level. The results of this small test will indicate your level, but during the first class in the school it will be really determined in which group you will be. The group classes are from 08:30 till 12:30. In these four hours you will learn a lot of aspects of the Spanish language: (irregular) verbs, vocabulary, adjectives and all sorts of basic grammar issues are being addressed. The lesson material is taken care off in various ways: oral, listening skills, writing, reading and even singing. Sporadically you will play a game, to spice up the classes. The lessons are very interactive and definitely not boring. There is more than enough room to ask questions, and because of the small group size, there is a lot of attention for all the students and their learning curve. The lessons don’t only take place inside the school. You will also discover Cusco to test your knowledge in real life situations! That can be a local market (to test your fruit and vegetable vocabulary knowledge! ), one of the beautiful parks or a museum. Sightseeing and learning Spanish at the same time! While learning a new language in school you can’t escape some “tarea”, or homework. If you are studying by yourself a bit next to the lessons, and make your homework, you can really progress rapidly. Because there is relatively little English spoken in Cusco, you will be forced to use your Spanish skills a lot. And there is no better exercise than practice! Next to the Spanish lessons the school also organizes a lot of cultural activities and trips in the weekends in the surroundings of Cusco. But…more about those topics in the next blog article, so stay tuned! Also keep an eye on our Facebook and Instagram posts for more info on the Spanish classes!